Veronica Gail Steele passed away peacefully on Sunday, October 21, 2018 at Wayne UNC Healthcare surrounded by her family. 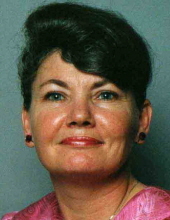 Gail was born in Wayne County to the late Leo and Frances Willoughby Steele. She enjoyed life and spending time with her family and friends. Gail had a big, loving heart, unselfishly putting others’ needs above her own, and she was always willing to lend a helping hand to those in need. She was a valued employee of the Steak Barn in Goldsboro where she served as a waitress for many years. The family will receive friends on Thursday, October 25, 2018 from 1:00 – 2:00 p.m. at Seymour Funeral Home followed by a service to celebrate Gail’s life at 2:00 p.m. in the chapel. Interment will be in Willow Dale Cemetery. Gail is survived by her sons, Devin Steele and wife Rhonda of Greenville, SC and Ronald Franklin Steele of Goldsboro; grandchildren, Veronica Danielle Steele and April Summerlin Thigpen and husband Derrick; brother, Steven Earl Steele; and sister, Toni Ann Spence. In addition to her parents, she was preceded in death by her daughter, Frances Dorette Steele Summerlin. In lieu of flowers, the family suggests memorials be given to 3HC, 2402 Wayne Memorial Drive, Goldsboro, NC 27534. To send flowers or a remembrance gift to the family of Veronica Gail Steele, please visit our Tribute Store. "Email Address" would like to share the life celebration of Veronica Gail Steele. Click on the "link" to go to share a favorite memory or leave a condolence message for the family.